Each new tax, law or regulation, comes with costs. Compliance, non-compliance, enforcement and punishment all have costs. 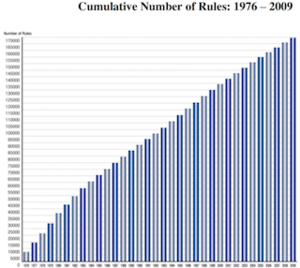 Our regulatory code has 174,545 pages of regulations (over 1,040,940 restrictions). Our tax code has over 73,954 pages. Our federal legal code has over 23,000 pages, and 3 attempts by the Congressional Research Service failed to count all the laws (they gave us an estimate of 4,450 federal crimes in 2008). But over double that spread among statutes, case law, and regulatory provisions. Then there’s another 300,000 criminal punishments burried within the discretion of administrative agencies (but that’s just an approximation, since no one knows for sure). Then you have to add in the state and local laws, regulations and taxes on top. How much does this cost our economy? In 2014 it was estimated that just the regulatory part was about $1.8 trillion (or $14,768 per household). A couple studies estimated that if we stopped regulating at 1949 levels (well after we created the FDA, FCC, EPA, and we were already over-regulated), we would have grown a bit over 2% more per year. So our economy today would be worth about $38.8 Trillion a year (over double what it is now). How much better off would you be with twice as much income/wealth? Those are the hidden costs of progressives good intentions (and what our regulatory state has cost us). Not counting legal/incarceration (the costs of over-criminalization), insurance costs (liability) , or some tax/behavioral implications on top. 1 What happened to the middle class and growth? 2 How big is the problem? 3 But what about the children? 7.1 What deregulation looks like? What happened to the middle class and growth? Someone was talking about what happened to the middle class growth. I explained we ate it in taxes, regulations, laws (and benefits): they didn't understand. So explained the scale of the problem. Every tax/law or regulation is the place where someone is saying, "If you don't do this, I'm going to have a guy with a gun, steal your life/liberty/property, so comply or else". Thus we should pick those thresholds with prudence. And we're not doing that, because we're not teaching liberty and tolerance in our schools, media or in our conversations. Statists (whether progressives, socialist, fascists, communist, etc) all advocate for "social justice", which is code for "more laws/force" to "fix things" (make things "more fair" at gunpoint, by taking some people's choices/opportunities to grow away from them). The normal response is to claim that's a melodramatic/extreme view, and that not every tax/regulation/law is theft. I suppose that's debatable. I think some are necessary burdens and encroachments; but that doesn't mean they're not force -- they're just justifiable force. So no matter what side of that you come down on, they're still burdens, with costs. And the punishment for non-compliance must exceed the costs of compliance times the risk of getting caught, or no one would comply. Most of all, they're all backed by the threat of force. That's kinda the point of a law, "do what I say, or suffer the consequences". If they didn't want the threat of force, they could just pass a guideline, or suggestion, or just appeal to the public (do a PSA) instead. Laws used to be the last resort of tyrants, now they're the first one some people reach for. (Always with the best of intentions). Category 1 laws serve no purpose but waste. (Well, as a friend pointed out, other than moral posturing). They cost money to create/pass (and print, maintain, etc). And if no one is doing anything to enforce them, then compliance will be the same as if they weren't laws in the first place. People that agree with them, will comply (as they would have). People that don't, won't (as they would have). Studies show that comply follows belief, not the other way around. So all this law really did is burden society and dilute the other laws (since you still have to still pass, train, print,, and finally ignore them). Category 2 laws create injustice and corruption. They are the ones that enables selective enforcement (injustice) and corruption. Since justice will not be blind, it will instead be inconsistent/political/unfairly enforced (prosecutorial discretion). Thus, these laws not only have more waste/costs than category 1 laws, but they build far more contempt for the entire legal/justice system, by everyone that witnesses the laws being unfairly applied (either too harshly in some cases, or not at all in others). Category 3 laws are the good laws. 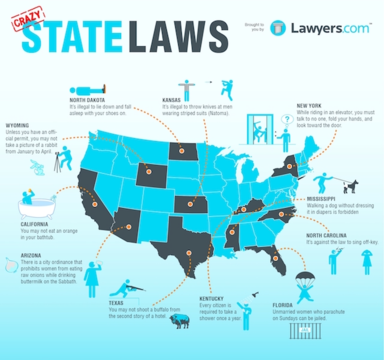 The very rare laws that most people agree with, and are worth enough to enforce for everyone. Important safety regulations, civil rights protections, and things that society will demand enforcement and punishment for violating. Since society cares widely, politicians will keep money and pressure going towards them. But the more #1 and #2's you have, the more you distract and dilute resources from the important stuff (#3's). I ask people who advocate for new laws, of the 30,000+ new laws we manage to pass each year, how many do you think are good ones (#3) and will be enforced fairly and roughly equally for all, versus #1 and #2 laws? 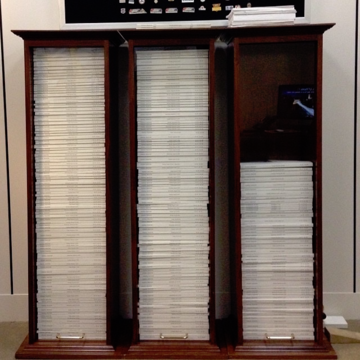 There 174,545 pages of regulations in our regulatory code (25 miles of paper, or 5727 hours/3 years of reading). There are over 1,040,940 restrictions spread among them. And we’re adding 10-20K new regulations per year (more under progressive administrations). But remember, that doesn’t include regulations that are agency discretionary regulations (and are outside of the regulatory code), or these numbers would be much larger. Then we have the most complex and worst tax code in the free world (73,954 pages), but you have to add all the regulation on top, because regulations are often enforced though the tax code, and the tax code often references the regulations. You can ask any two IRS auditors, on what just about any one of those pages means, and get 3 mutually exclusive opinions. Many of the largest Tax compliance companies (H.R. Block, KPMG, etc), at both personal and business levels, have lost battles with the IRS or been caught in non-compliance, because not only is it so big and complex, but it's so poorly written and self contradicting, that most of it is ambiguous and unclear. It means what the auditor wants it to mean -- thus they're all category 2 laws (with selective enforcement, corruption, abuse, and rife with injustice). We have so many federal laws, that the government tried to count them in 1980, and failed: they said around 3,000, and it was 50 volumes (26 books and well over 23,000 pages back then). They tried to count them 3 more times since, and gave up every time: the Congressional Research Service claimed they only have 600 employees and 106.8 million budget, not nearly enough staff to do it. Finally in 2008 they gave us the approximation of 4,450 estimated federal crimes in the criminal code alone (just ones you could do prison time for). But that’s only the criminal code: over half of all crimes are spread out among statutes, case law, and regulatory provisions. Then there’s over 300,000 criminal punishments within the discretion of administrative agencies (but that’s just an approximation, since no one knows for sure). But that's only scratching the surface. Usually over half the laws, taxes and regulatory codes, are at the local and state level -- at least doubles the total complexity/burdens. I figure 556,998 pages total, conservatively (doubling the federal numbers for all the states combined). A stack of paper 80' tall (stacked), 80 miles long (layed end to end), or 9 years (18K hours) of full time reading (40 hours a week, no breaks). And we have armies of legislators adding many tens of thousands of pages each and ever year. (That's only up to date for 2014, with some of those numbers from 2011 or 2008). Remember, ignorance of the details of all those laws is no excuse ("Ignorantia juris non excusat") -- whether you're aware of the law or not, you're still liable, criminally or civilly, for non-complaince. And that includes secret laws, that aren't even publicly known. (Many parts of the tax code or terrorist laws are not publicly shared, so you have to guess to avoid those). Now in some ways, it's not as bad as all that. Because laws/taxes/regulations are often specific to region, sector, business, and so on. Thus, not all those laws are going to apply to you, and you often have an army of specialists working for you (your suppliers, accountants, consulted agencies, etc) are all trying to help you stay in compliance with the parts that intersect between them and you. But you have to pay for that help, take it on faith that they know more than you do, and trust that you have complete (or near complete) coverage, between all the experts you need to waste money on, to get that coverage. And still, there's thousands of crimes you're guilty of, that you don't even know about. In other ways, it's worse than all that, because there are laws very, very few people could know about, because they say that you can be guilty of a law in any OTHER jurisdiction (state or international) and that makes you guilty of a local crime. Take 16 USC 3370, which says if you have in your possession (or have bought, sold, or just transported) any animal, fish or plant that's illegal in any city, state, country or indian tribal land, then you're guilty of a federal crime. If one Indian tribe outlaws gopher snakes, everyone whose got one on their property is guilty of a crime, holding of a fish that's below the size limit (even for the purposes of releasing it from the hook and freeing it) is guilty, as is petting or holding a friends pet that you didn't know was illegal in some other country. So there is no innocence in America, we're all guilty of something, your only cover is that there are bigger/badder degrees of guilt, so you hope you won't be targeted. But relatively innocents get targeted, all the time. When ever I bring this stuff up, the other side of course either accuses me of wanting no government/laws/regulations -- and when they have to misrepresent your side (and don't ask), it shows that they've lost; intellectually, emotionally and philosophically. They'll start arguing straw-men to save far -- which is ironic, because being wrong and learning isn't a loss of face to me, but being so insecure that you have to lie (or misrepresent others) is the most shameful act of all (intellectual cowardice). Of course you need some government, it's just how much more liberty could we give people, without the nation crumbing. But if they accept the truth and start to realize how overboard we've gone, they're just one step away from learning The Broken Window Fallacy, the frauds of Keynesianism, and then basic economics. Once they start down the path of knowledge, it's hard to turn back. They'll be snubbed by their liberal friends, and no longer be able to look at the latest quick fix knee-jerk solution, without getting a little sick at all the hidden costs and people hurt by those policies. And who knows where that could lead? Watching Fox Business Channel? Voting against Democratic Socialists? When someone tried the tack of we spend too much on the military, remember our tax army is 3x as big as the real army. When is enough, enough? What does this all mean? That every American is guilty of at least 3 federal felonies PER DAY (and most don't even know it), that's not even counting state and local, regulatory crimes, or tax violation. No two tax auditors can agree on any one provision: thus you’re always potentially guilt of tax crimes/penalties, the only question is are you worth going after (for economic or political reasons). And that book/study was written in 2009 (hundreds of thousands of taxes/laws/regulations ago). They never bothered to estimate how many more state and local felonies you're guilty of. And no one knows how many regulatory or discretionary crimes we're all guilty of, every day. As Stalin's secret police chief (Lavrenti Beria) famously said before disappearing, "show me the man and I will find the crime." Everyone is guilty of something in a police state, it's just whether they want to come and get you or not. As a Martial Arts instructor, on that I was familiar with, and use a lot with my California friends is: Q: do you have a circular saw blade (that's not on a saw)? A: Yes. Felony, under California Penal Code 22410 Shuriken law -- basically any flat multi-pointed piece of metal, that can be thrown, is a felony. Sounds like a circular saw blade to me. (And some cops and DA's, since people have been arrested and convicted, under this law). When you empower anyone with ultimate power (even the noble government), it's only a matter of time before it's misdirected. The meaning was there was plenty of power and complexity in their legal (back then), to allow persecution of anyone, over almost anything. Welcome to Progressives America, where they have given us many, many, many more laws and regulations, to micromanage every aspect of your life, or find you guilty of something. No honest person can be reasonable aware of all the laws they should avoid, not that you could actually avoid them and exist in our society, since many of them are simultaneously contradictory. An example I used was a California man that was sued by one agency for having plowed a firebreak on endangered rat habitat, and sued by another agency for not continuing to do so. The solution to the ESA (Endangered Species Act), was if anyone found any of those animals, they had to kill it quickly and hide the evidence, or the government might flag your land as protected from your own use: creating many criminals, and killing far more animals than they ever protected. So I ask again, with many 10's of thousands of new laws and regulations getting passed each year, (as well as the aggregate number of all that have been passed before), how many of those laws do you think are category #3 laws, and adding value? And how many are just #1 or #2, or ones that could be better served through education and asking nicely? 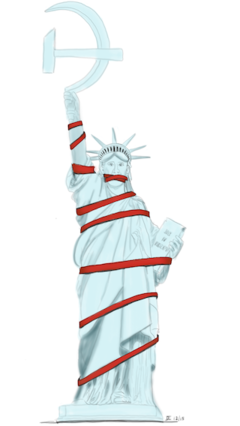 Because every single one of them is a new restriction on liberty. One of the firs things I usually ask progressives is, "when is enough, enough?" What percentage taxes are enough, and how many more laws, before they could declare we have enough, and not take any more liberties away. The only answer I've gotten is "more". I suspect until they discover a mirror and learn tolerance, it always will be that way. I like Senator Mike Lee's point -- Article 1, Section 1 of the Constitution (non-delegation doctrine) said Congress was specifically NOT given powers to delegate their authority, to prevent exactly this from happening. (A progressive Supreme Court, invented new law in 1928 and said they could do this, and the Court has shirked it's constitutional responsibility by not correcting this invention). Sadly, state laws roughly double the count over the Fed.